The moral of this Aesopian fable from a mere 2500 years ago is that doing good to evil will only lead to more evil. Aiding those who kill only brings more death, not life. It is human nature to think that people will return good for good and evil for evil. This kind of thinking perversely leads some to assume that if they are being assaulted, then they must have done something to deserve it. This logic is routinely used to argue that Islamic terrorists are simply paying us back in the same coin. But the assumption that evil exists because evil has been done to someone else, tracing back to an original primal evil of injustice that can only be healed with social justice, is itself evil. Those same lines have been routinely taken up by those eager to pen their own apologetics for evil. In the wake of another early September, September 11th, Auden’s poem was re-embraced once again by those penning essays explaining why we were the real terrorists to whom evil had been done in return for our own evil. But while it is easy enough to dismiss W.H. Auden as naive, snakes don’t always look the way you expect them to. Particularly snakes who take refuge in the mind of man. 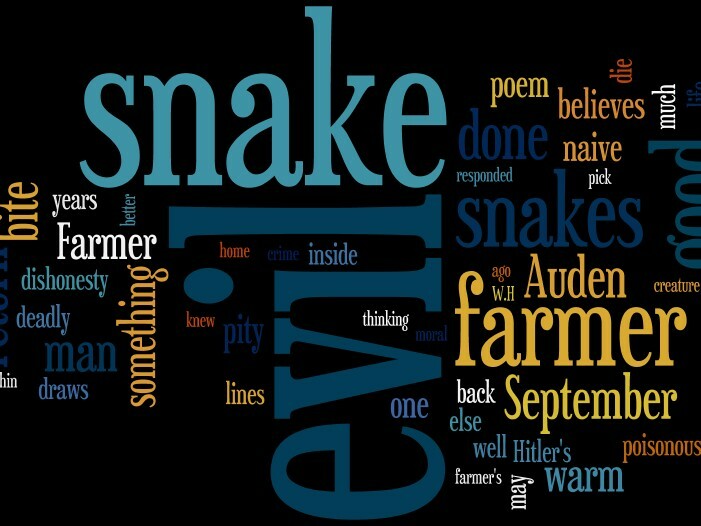 Auden was more snake than farmer and his words were the snake-words of one scaly creature excusing the evil of another. In September 1939, the USSR and Nazi Germany had an agreement. And the man who two years earlier had penned the line “The conscious acceptance of guilt in the necessary murder” in his poem “Spain”, when referring to the Soviet atrocities in Spain, was not a pacifist. He was one of the snakes. In time, Auden would describe his poem as ”infected with an incurable dishonesty”. The infection, the snake bite of incurable dishonesty, passes through the words. The dishonesty is a poisonous disease. Are those who go on to quote “Those to whom evil is done / Do evil in return” to excuse and justify terrorism, the farmer or the snake? On the surface of it, there is no clearer or simpler justification of evil than these lines. They presume that anyone who does evil, has been first sinned against. And while that may not entirely render them guiltless, it clearly spreads the guilt around and adds a touch of morally equivalent white paint to the murderous figure crouching in the center of the room. Auden repudiated the poem, but the idea behind it is just too appealing to give up. And so we return to the farmer and the snake again. Why does the farmer pick up the snake? Is it naive pity, or is there something in the farmer that draws him to the snake? Is there something in those who feel so much pity for evil that draws them toward evil? The dichotomy between the farmer and the snake may not be so simple after all. Because even an idiot knows better than to shelter a snake. Nor does a snake appeal to any normal person as a creature that needs sheltering. Is it only misguided pity that draws a man to shelter a snake, or something else entirely? Because the very idea that good will be repaid with good and evil with evil has something else lurking in it, as we’ve already seen. The farmer’s logic can be read both ways, the naive man who genuinely expects that only good can come of doing good until he dies of that sort of thinking, or the evil man who believes that he is safe from the snake because the evil within him and the snake makes them both victims. For the farmer to act as he does, he must believe that the snake is not evil, and such a belief is the province of the very naive or the very evil. And so we return to September 1, 1939, again. To Hitler’s tanks riding into Poland. To the inability to describe evil as evil. And we return to September 11, 2001, as well. And to so many other days. To free countries beleaguered by an enemy within its own borders, by the snakes they have taken to them, kept warm and perish, poisoned by their bites. But the curious thing is the sight of all these farmers lovingly clutching handfuls of poisonous snakes to them, proclaiming how wonderful they are, and shouting down anyone who would warn them about the deadly poison. As Aesop knew some 2500 years ago: The greatest kindness will not bind the ungrateful. Virtually every civilized country affected by Muslim terror, has responded by trying to make life better for Muslims. But no matter how much they warm the snake, it still bites. The snake will always bite. Only the fool or the sociopath genuinely believes that evil is returned only for evil. That snakes will only bite you, if you bite them first. That if you warm them and cuddle them, they will warm and cuddle you in turn. Things that are poisonous bite. Was the farmer’s crime, pity or identification with the snake? Think of Auden identifying to some degree with the grievances of Hitler’s stormtroopers. Or Israel’s Barak saying that if he had been born a Palestinian Arab, he would have become a terrorist as well. That is the snake speaking from inside the farmer. The voice of the snake that says the only difference between us and evil men, is that they have suffered and we have not. That sees not a moral continuum, but one in which deprivation releases and justifies our worst impulses. That says evil is actually proof of righteousness. Every atrocity is proof of suffering. Every crime reveals a tormented soul. The worst monsters must have endured more abuse than we could possibly imagine. Evil is saintly and good is privileged. That is the problem of the farmer who believes that inside he is really a snake, and the snake who believes he is really a farmer. For if there is no difference between good and evil, but that those who do good have had good done to them, and those who do evil, have had evil done to them — then we can welcome in the snakes and all will be well because we are all snakes inside. And it is only by warming snakes that we change that. This in essence is the worldview of liberalism. This is the key to much of its madness. And so they pick up the snake, and are bitten and die, wondering why their worldview which seemed so right, proved to be so wrong. And we die with them. For the farmer has carried the snake home, made a nest for it, and filled his home and the homes of his neighbors with snakes. And it may be hard to know where the farmer began and where the snake ended.